Hello there! Welcome to “It’s Not Shiplap Blog Hop”. (Hope that made you smile!) Shiplap can be such a beautiful wall treatment but right now we are seeing it all over the place thanks to Fixer Upper for making it so popular. So when Jenna from Rain on a Tin Roof asked us to share ideas for wall treatments that were NOT shiplap I signed up! If you are coming from the lovely Cassie Bustamante‘s blog, welcome. I love Cassie’s boho eclectic- neutral style and can’t wait to see what she shares for this wall hop. Last year you might remember that I participated in a similar blog hop featuring wall art and I did this washi wall. For this wall hop, I decided to update it black washi tape for a more graphic pop! Using the previous grid, I simply replaced it with the new tape. Super easy. I needed something simple since we are moving in three weeks! I can’t wait to cover a wall in our new home in washi tape. It only takes a little time! Since I already had a nod to asian art, my blue and white chinoiserie garden stool and some greenery completed the piano studio. I wish I could bring my piano students with me when we move. They are the sweetest kids. My other favorite temporary solution for walls, is my foyer fan wall! Just stick those babies up with command strips and it becomes renter friendly decor! Another project I’ll probably repeat in our new home. This was a nice little break from my Fall Series but you can expect some more Fall projects later this week and next. In the meantime, there’s a lot of talented bloggers’ wall makeovers to enjoy! Next on the tour is Two Thirty-Five Designs. I’ll see you over there. Kathy, this is such a cool idea! I love the black and white! And that piano is just amazing!!! Thanks Jenna! I definitely need to create a black and white wall when we move. 🙂 Thanks so much for putting this together! love the black and white, but that fan wall is one of my favorites! i love that it embraces where you are living right now! Of course I’m loving the black and white wall! Such a great idea. Love what a statement your wall makes without a ton of work! Thanks Steph! It does. 😉 Wish I had done black sooner. I love love love! the geometric wall, and those fans are so much fun! Thank you Ariel! I have quite the collection of fans now. They are everywhere for only a $1!! 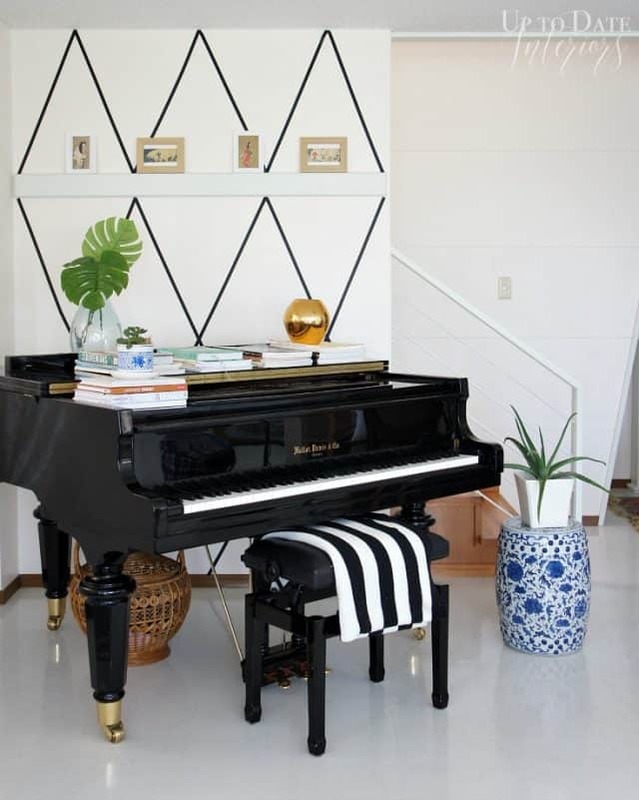 That geo wall with the piano is Heavenly…no lie! I love it. Question: when you move is your piano going too? Thanks Jess! Yes, the piano stays with us. I bought it before we even had a dining room table years ago! lol It’s my third child. I love the graphic black and white design!! So pretty! And those fans…. beautiful temporary solution!